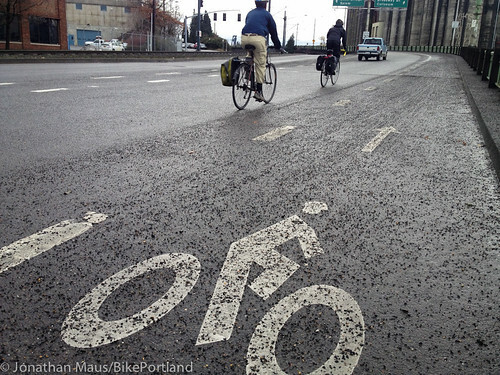 Gravel on the bike lane of N Interstate Ave as seen this morning. 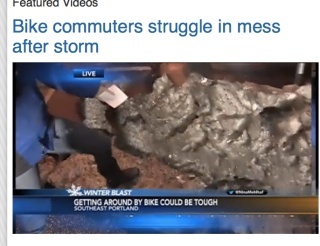 Bad biking conditions made the evening news. With the worst of the snow and ice storms behind us, the roads are slowly returning to normal. That is, unless you are trying to walk or bike. There is a lot of unused roadway space on SW Broadway between Burnside and Pine. Why not make it an official public plaza? 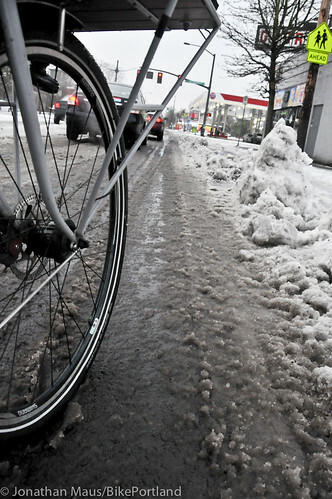 When snow falls on city streets it eventually melts and goes away thanks in large part due to the self-plowing effect of motor vehicle tires. 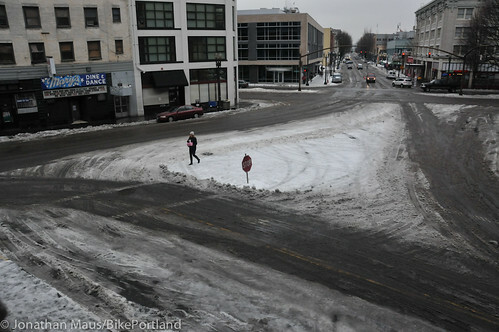 But where cars and trucks don’t go, the snow remains as visual proof of unused roadway space. As we enter the fifth day of a major storm here in Portland, the snow that has accumulated since last week is now beginning to melt. Over the weekend, temperatures stayed below freezing and the metro area was covered in a layer of ice. Those conditions presented a set of challenges on their own. Now, with temps climbing just a bit above freezing, the Great Thaw has begun in earnest. Residential streets remain a big challenge to ride on. It’s easier with larger, aggressively treaded tires; but for the most part a lot of snow and ice still remains. 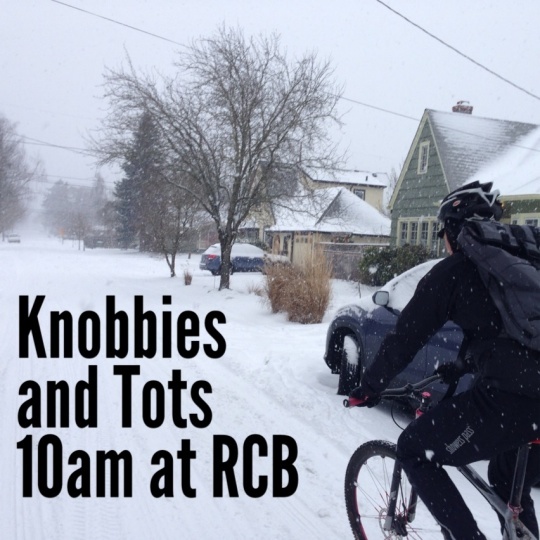 PBOT does not plow residential streets, and they don’t get much auto traffic, so they will be the last ones to be clear of snow and become easier to ride. Neighborhood collector streets, like N Ainsworth shown below, are a bit better as long as you take the lane and ride in the wheel rut created by auto traffic. My chosen tool for bike fun today. 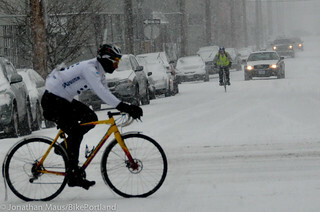 With the City of Portland and other agencies telling everyone to stay indoors due to the sheet of ice that has blanketed our town, I couldn’t wait to leave the house this morning and see if I could still ride a bike. So, I went out to my shed, pulled down my mountain bike and headed out. Turns out it’s not as bad as I expected. 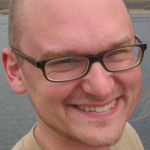 That being said, if you do plan to play around the neighborhood on your bike today, here are a few tips to consider. 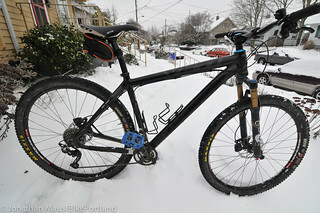 The bike I’m using is a 29-inch mountain bike with 2.2-inch knobby tires. 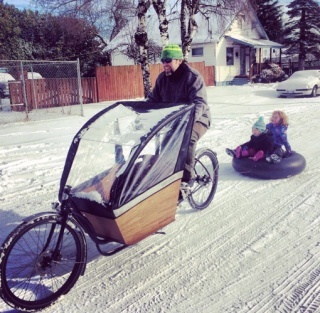 Either a similar mountain bike or a fat bike is highly recommended. Lower your tire pressure to get more traction. Less air means more of the rubber and knobs on your tires will come in contact with the ground. More contact the better. Are you disappointed that the Worst Day of the Year Ride was cancelled on, well, the worst day of the year? advantage of a snow day. Snow! It’s everywhere and it keeps coming down! I know many folks in other parts of the country more accustomed to snow are laughing at us; but here in Portland the amount of accumulation we’re seeing is pretty rare. It’s stayed cold and dry enough for several days that the entire city is covered in several inches. To us, this is sort of a big deal. A rider on the street Thursday. Update: The Worst Day Ride’s organizers said Saturday that they’ve canceled Sunday’s event completely (making various earlier misreports about the cancellation retroactively accurate, I suppose). People who’d bought places in the ride will get automatic entry in next year’s. As of Saturday afternoon, the National Weather Service expects another 4 to 8 inches of snow to fall by Sunday afternoon, plus freezing rain and ice in some areas, on top of the three to five inches that fell Friday and continued to pile up Saturday. Alas, Mother Nature wins this round. We have been forced to cancel the event, or more accurately, postpone for one year. Worsening weather conditions and a forecast of freezing rain tomorrow make for unsafe conditions. Your safety and the safety of our support staff is our number one concern, and conditions have dictated that it would be nearly impossible to guarantee the well being of everyone during this event. We appreciate your understanding of this decision and want to thank you for your support by guaranteeing your entry into next year’s Worst Day of the Year Ride. In its voicemail message Saturday, Good Sport Promotion said an email in the next week will contain instructions on how to claim next year’s ride. It didn’t mention whether cash refunds will be available on request. Our original Thursday night post follows. This woman had reason to smile. 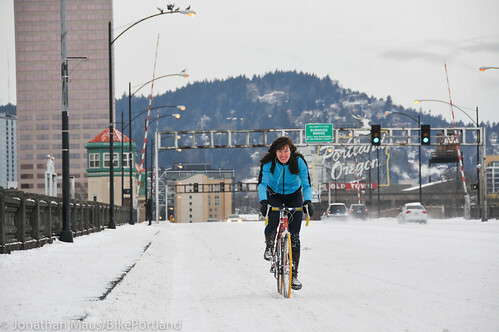 The sun popped out and the roads were nearly empty in and around downtown as she rode over the Burnside Bridge. 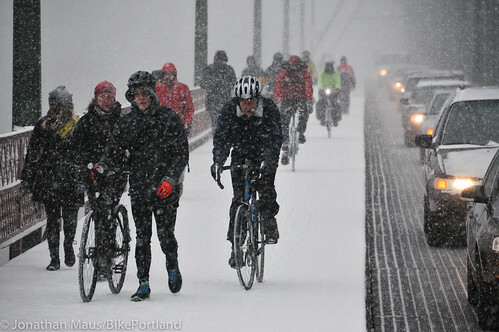 Conditions were tricky on the Hawthorne Bridge, with some people opting to walk their bikes.